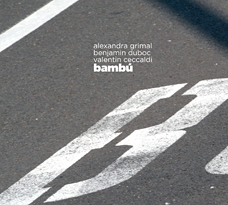 The open-ended, hard-edged trio of Alexandra Grimal (soprano and tenor saxophones, voice), Valentin Ceccaldi (cello) and Benjamin Duboc (double bass, voice) excels in creating dramatic presence. One might say that their kind of music is a "thinking person's" free improv. There are some moments when there is a meditative care and hushed expectancy. Other segments burst forward in vivid timbral colors. In the end, we get freshening music, both lyrical and other-earthly. This is surely a music beyond category. It does not care what it is called. It sings itself.